The Studio will be OPEN the following holiday dates, but if you prefer a change, please let me know. —Monday, December 17 – 4:00 p.m.
—Wednesday, January 2 – 6:00 p.m.
—Monday, January 14 – 5:00 p.m.
1) Our Summer Tour ends in Westfield tomorrow. 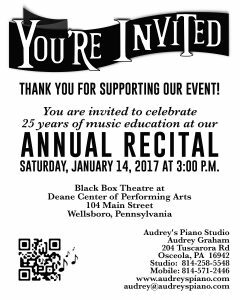 I’m looking forward to it with eager anticipation with 11 students performing. It was such a blast that next summer I hope to plan 3 stops and have concert tour t-shirts to wear! If anyone has ideas for new places, please let me know! 2) Our Annual Event: Planning for January 2019 – possibly straying from our traditional second Saturday at the theatre and picking up January 19 at a more local venue. 3) Studio closings. There will be NO LESSONS on the weeks noted below. And looking past that, I will be open on Tuesday January 1 (holiday), but if you would like a switch, please just let me know. I will remind you about this as we get closer. Next Stop: Westfield Senior Center! Friday, August 10 at 10:00 a.m. Things went well in Wellsboro. This time would YOU be interested in joining us? I have had just a couple show interest in playing at such an event, but now that we have a time/venue – would YOU be interested in joining us? Robert M. Sides has no events planned for 2018 so looking for possible interest in putting on a small NON-FORMAL concert ourselves, perhaps in a city park or nursing home mid-summer. Our new semester schedule will begin on September 6. Yay! I’ll be contact with everyone for lesson days/times. Bobby earned a Medal at the Showcase Competition last Saturday. Way to go, Bobby!! We have seven Piano Guild participants: Emma, Caroline, Grace, Hannah, Robert, Meriah & Alyssa. Auditions will be held on Friday, May 27 at the Cedar Arts Center in Corning, NY – 155 Cedar St. I will give more information as it becomes available. We’ll be ramping up for both events in the upcoming weeks. It’s going to be fun!! Hello Everyone! Announcing our new practicing contest that will begin at your lesson THIS week. 1. 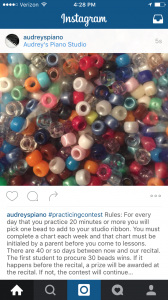 For every day that you practice 20 minutes or more you will pick one bead to add to your studio ribbon. 2. You must complete a chart each week and it MUST be initialed by a parent before your lesson. 3. 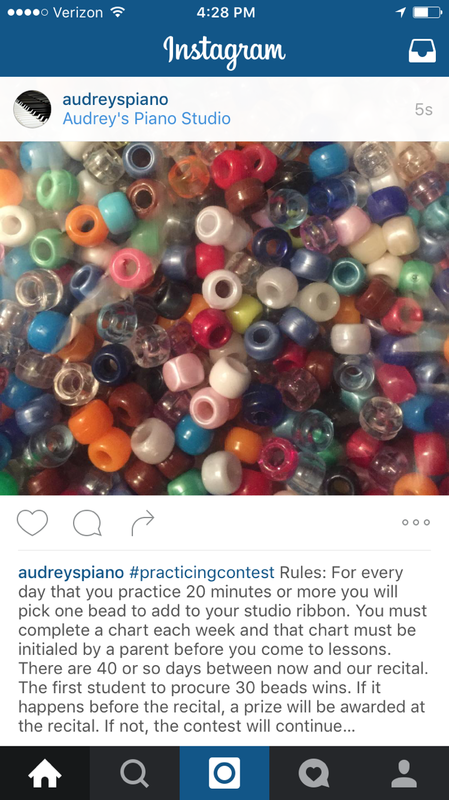 Contest will end when the first student receives 30 beads. To be fair – everyone else THAT WEEK that accomplishes the task will be included among the winners. 4. 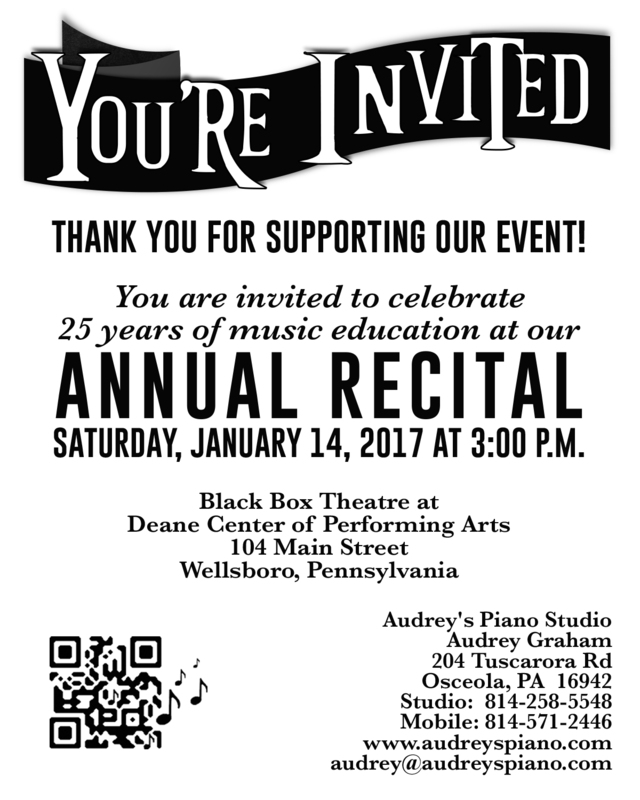 It is hoped that many will practice at least 30 of the 40 or so days leading up to our big recital, so the prize will likely be announced at the show. Now – GET PRACTICING! And don’t forget to include your parents: THEY MUST INITIAL your sheet EACH WEEK. A copy of the final practicing sheets will be emailed to your parents when the contest ends. ENJOY your playing – you are all amazing!